When your life is in danger and you can't get hold of emergency services by phone or radio, activate your distress beacon. Your beacon can be activated from anywhere on the Earth's surface, regardless of whether you were travelling by air, land or sea. 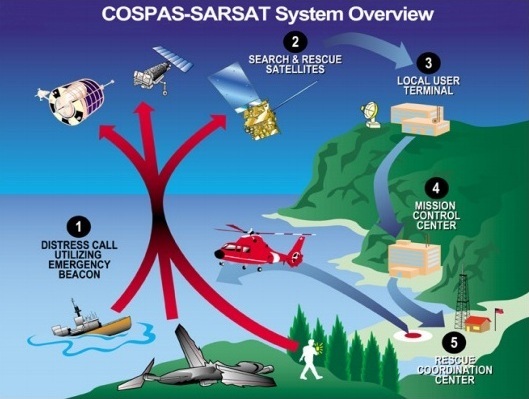 The international search and rescue satellite system, Cospas-Sarsat, listens from space for distress signals. When it hears a signal, it notifies the nearest ground station. Beacons transmit on 406MHz which is detectable by satellite and 121.5MHz so emergency services can hone the beacon with special search and rescue equipment. Your distress call is escalated through a local user terminal, mission control centre and then the rescue coordination centre (RCC) responsible in that region for arranging search operations. If your beacon is registered, the details are provided to the RCC in the country in which the beacon is both activated and registered. Search and rescue authorities commence search operations as soon as they can. If your beacon is registered, AMSA Search and Rescue will look up your account and ring your emergency contacts immediately. If emergency contacts are aware of trip details or trip details have been submitted online, search operations can be commenced much sooner. So it is essential to keep your details up to date. The time it takes for rescue will vary depending on the circumstances. Be prepared to survive. When you see or hear search personnel or aircraft in your area use flares, torches, or light a fire (if it's safe) to help them pinpoint your location. The time it takes for search and rescue personnel to reach you depends on a number of factors, including the weather, terrain and accessibility of your location. The more remote the location of the distress incident, the longer the response time. In all instances, be prepared to survive. Satellites cannot detect beacons through mountains, trees or buildings. If your beacon has not been deployed correctly with the aerial vertical in a clear open area or you are located in a valley, geostationary (GEO) satellites are unlikely to see you. In these cases, you must wait for polar-orbiting (LEO) satellites to pass overhead, which may take several hours. Another important factor which determines how long your rescue takes is if you have a Global Positioning System (GPS) beacon or a non-GPS beacon. The Cospas-Sarsat System is divided into space segments comprising distress beacon receivers on Polar-orbiting satellites and on satellites in geo-stationary orbit over the Equator. The ground segment is made up of a network of Local User Terminals (LUTs) that are the ground receiving stations for the satellite transmissions with Mission Control Centres (MCCs) that analyse and pass the distress alerts to responsible Rescue Coordination Centres. In the Australian search and rescue region there are three LUTs located at Albany (WA), Bundaberg (QLD) and Wellington (NZ) that are controlled by the MCC located within the Australian Joint Rescue Coordination Centre (JRCC) in Canberra. Alerts from 406 MHz distress beacons may be received and processed by geo-stationary satellites and passed to JRCC-Australia within minutes. If the beacon has GPS capability then a very accurate position may be transmitted with the alert. Non-GPS beacons require detection by a Polar-orbiting satellite before a position can be obtained. Note: Do not turn off your distress beacon until advised by rescue services. Cospas-Sarsat website: What happens when I activate my beacon?